The Sutton Coldfield Volunteer Rifle Corps was formed in 1880, and at full strength it comprised 140 officers and men. Sutton men wishing to join a join a volunteer force before 1880 could probably have gone to the Warwickshire Rifle Volunteers; if they did, they had to pay for their own kit, but the attraction was that they could then rub shoulders with the gentry. Sir John W C Hartopp, Baronet, was the Lieutenant-General of the Warwickshire Rifle Volunteer Regiment, and on July 1 1867 he invited the first administrative battalion to hold a field day in Four Oaks Park. The event was due to start at 2.30, but the trains bringing the men to Sutton were running late, and they did not get there until 4.00. The strength of the corps included 27 officers, 45 sergeants, 61 members of the band and 450 privates. Four Oaks Park was described as “not surpassed in this neighbourhood for beauty of scenery, variation of hill and dale, and the massive foliage of the venerable forest trees which here abound”. After partaking of some refreshments, the battalion paraded on some “comparatively level ground” at the back of the hall for drill, followed by various exercises. According to the report in the newspaper, “The large herd of deer were somewhat shocked from their usual quietude by the repeated volleys of the riflemen, and leaving their usual haunt under the shade of the forest trees in front of the hall, they sought refuge in the more sequestered nooks of the grounds adjacent to Sutton Park”. 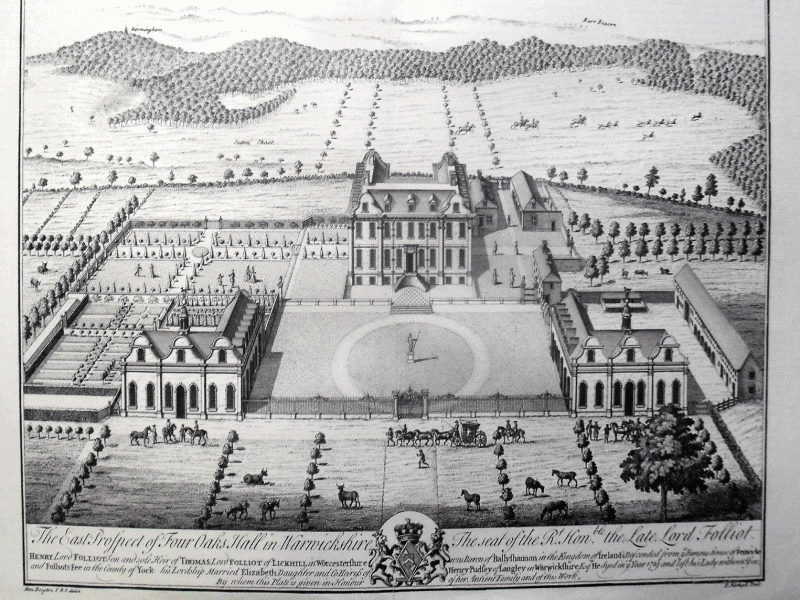 Prospect of Four Oaks Hall from the East, by Henry Beighton, 1730. The newly-built hall is shown lying between the public road and the paling of Sutton Park, with a few deer grazing in the small park to the right of the hall. Later owners would remodel the hall, take in 111 acres of Sutton Park and divert the road away from the hall, resulting in the extensive grounds and large herd of deer described in 1867.